So, today was the last ‘adventure’ day for us as tomorrow we fly home. 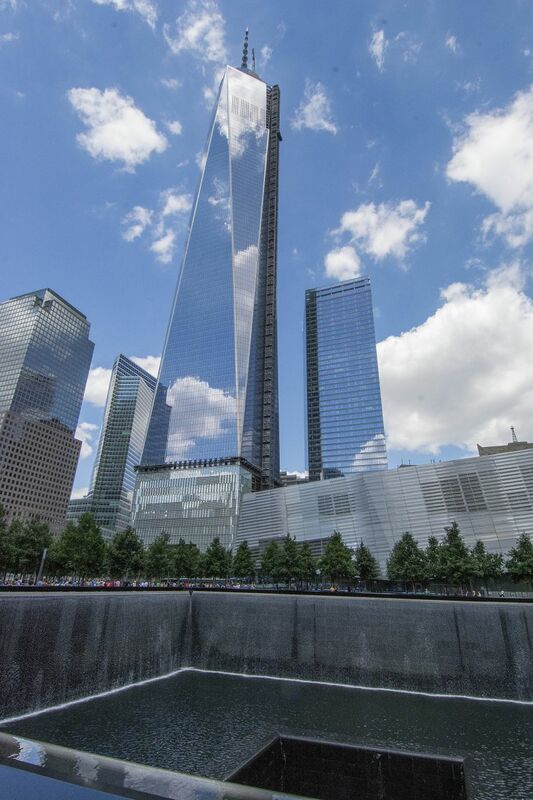 We visited the 9/11 Memorial also known as Ground Zero, in New York City. We travelled by AirTrain from the airport, then travelled on a double-decker overland train and last of all on a subway. It was different and with the help of one or two people we actually managed to buy the train tickets too!! 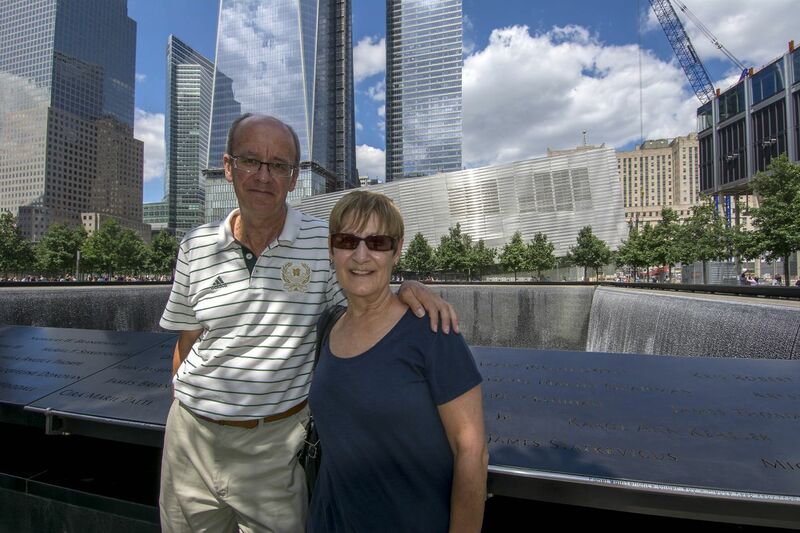 We expected it to be an emotional visit to Ground Zero and it certainly was. Because the area is still under construction we had to book tickets beforehand (Nat, big thanks for the info, without that we may not have been able to go into the Memorial today) and the organisation, as with all things American, was excellent. There were people from all over the world and after all the adventures we have had on this trip, this was very sobering. 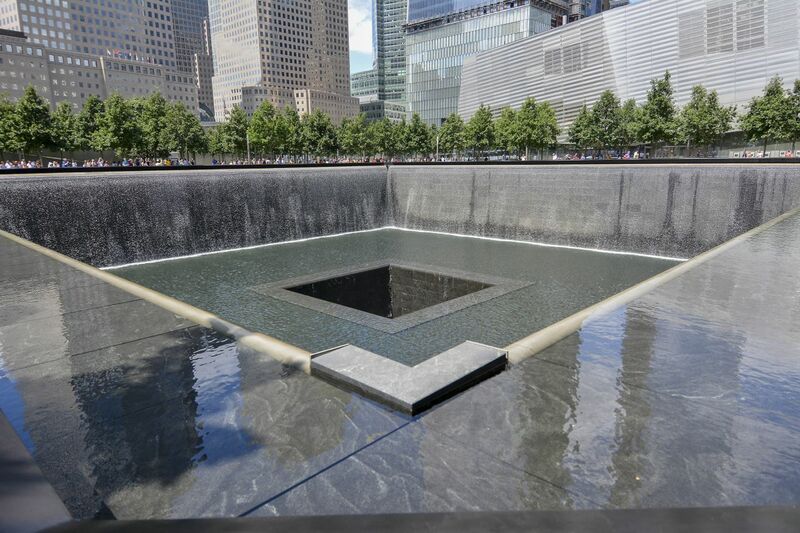 The Memorial consists of two pools set in the footprints of the original Twin Towers. Thirty-foot waterfalls, the largest in North America, cascade into the pools, each then descending into a centre void. 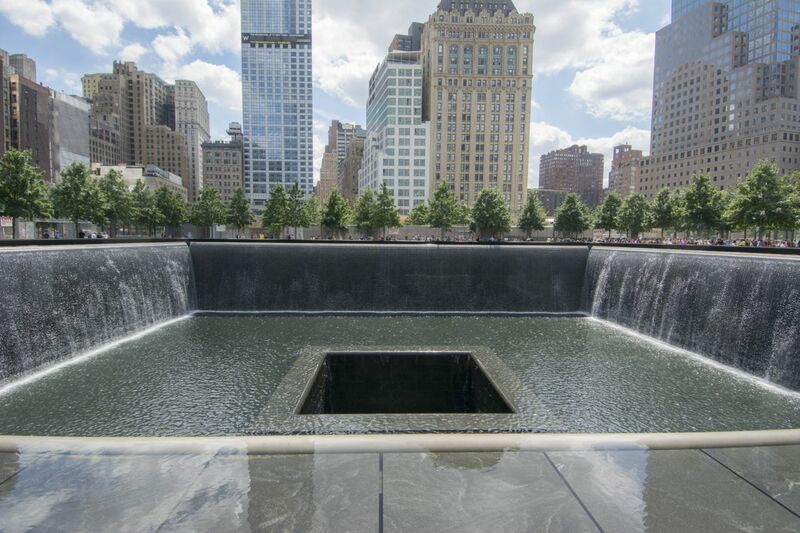 The name of the victims are inscribed in bronze parapets around the pools. 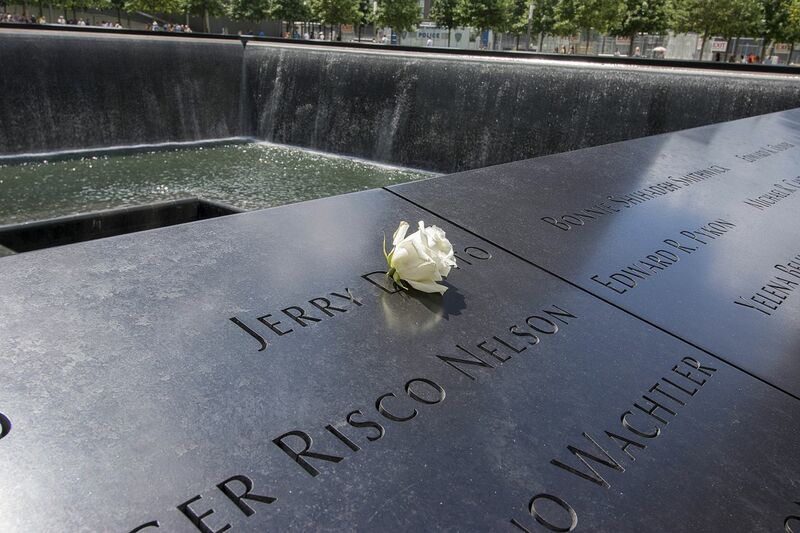 Every day a white rose is placed in the names of those whose birthday it would have been that day. For the 1000 people who do not have a final resting place, there are paving bricks set between the two pools and each one is dedicated to one of those people. Reading all the names was very emotional but one of the things we found particularly upsetting was reading the names of some of the ladies who lost their lives that day and who were pregnant. Next to each of the ladies names was added “and her unborn child’. The master plan for the site calls for a spiral of new towers around the eight-acre Memorial and will also include a Museum (due to open in 2014). In the atrium of the Museum stands two steel tridents – forked columns from the original North Tower. On the site is a Callery pear tree known as the ‘Survivor Tree’. 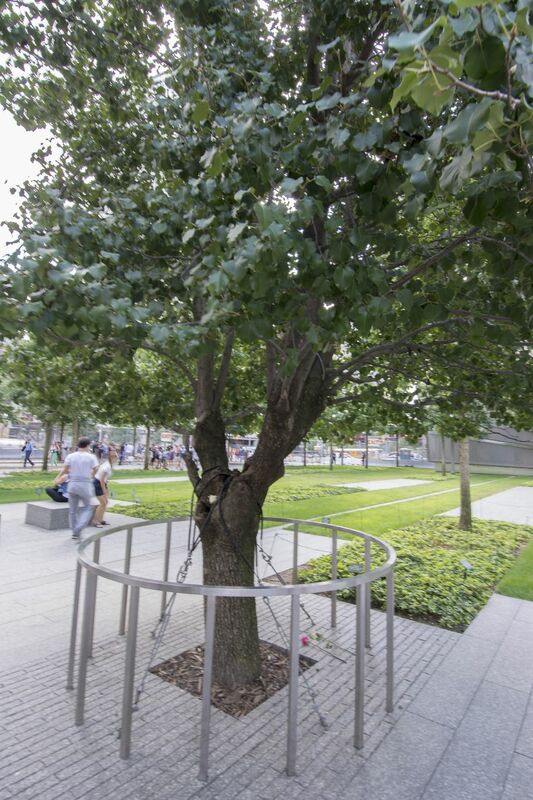 This tree was planted in the 1970s and stood on the original World Trade Centre plaza. After September 11th, workers found the damaged tree, reduced to an eight-foot-tall stump, in the wreckage of Ground Zero. It was nursed back to health in a New York City park and grew to be 30 feet tall, sprouting new branches and flowering in the springtime. In March 2010 the tree was uprooted by severe storms, but true to its name, it survived. 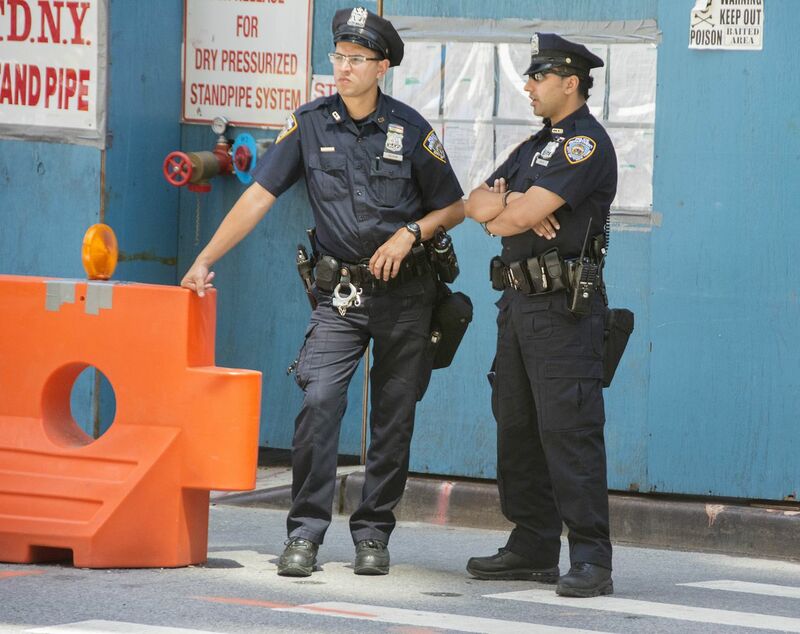 In December 2010, the tree was returned to the World Trade Centre site. 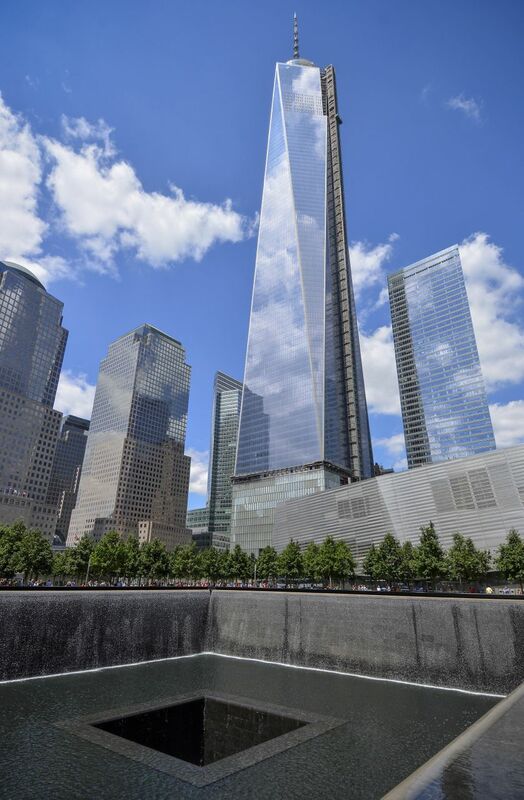 It embodies the story of survival and resilience that is so important to the history of September 11th. We then went on to St. Paul’s Chapel that stands very near to the 9/11 Memorial. 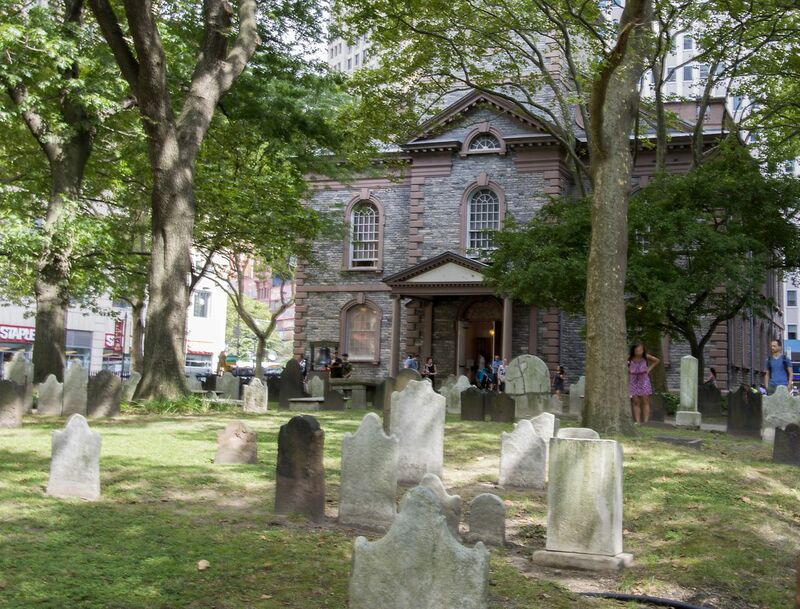 The Chapel first opened in 1766 and survived ‘The Great Fire’ of 1776. President George Washington in 1789 attended service there on his Inauguration Day and it survived the September 11th attacks on the World Trade Centre while the buildings around the Chapel were either destroyed or very badly damaged. During 2001 and 2002 it became home to an extraordinary round-the-clock volunteer relief ministry for recovery works at Ground Zero. 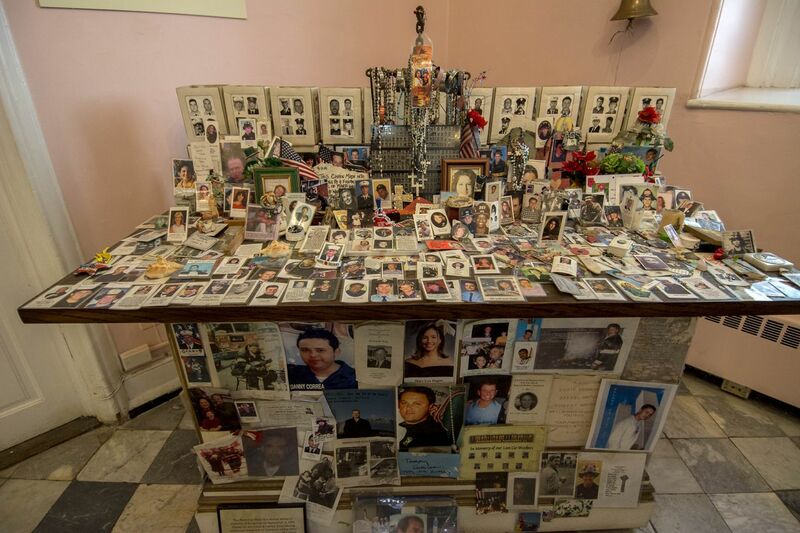 Family and friends of those missing in the attack went to the chapel and left photographs and stories about their loved ones and people from all over America and the world visited the chapel to leave tributes and a lot remain their today. Outside of the Chapel is a bell called the ‘Bell of Hope’. Accompanied by an honour guard of British police offers it was presented to the people of New York by the Lord Mayor of London and the Archbishop of Centerbury on September 11th 2002. 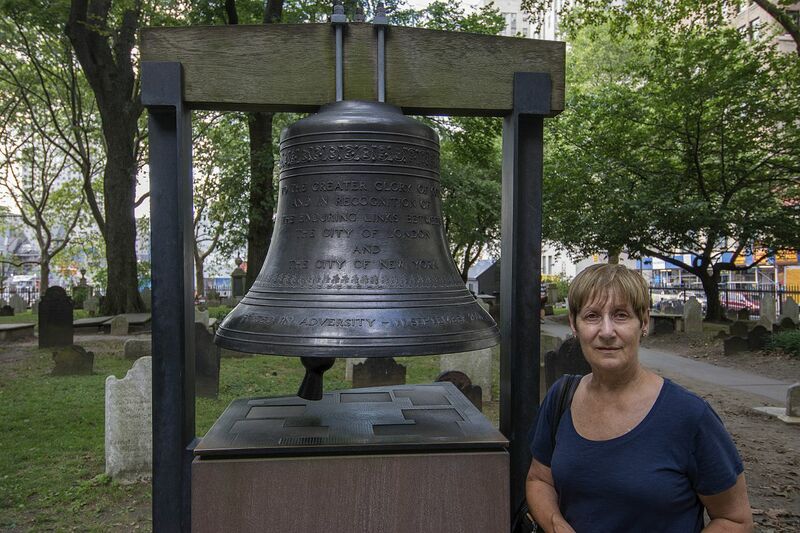 It was created by the famous Whitechapel Foundry in London which also cast America’s Liberty Bell and London’s Big Ben. The bell is rung every September 11th, was rung on March 11th 2004, when trains were bombed in Madrid and on July 7th 2005 after the London tube (subway) and bus attacks. The ringing of the bell symbolises the triumph of hope over tragedy.